Thank goodness NHL’s eye is doing so much better. The antibiotic drops really seem to be helping. The croup cough will not go away, so I will likely give a call to the allergists office Tuesday when his doctor is back from vacation. Something needs to help him and perhaps it is using the nebulizer that has been sitting and collecting dust. Before eating last night I decided to take JSL out of the house. He had been stuck inside all day. 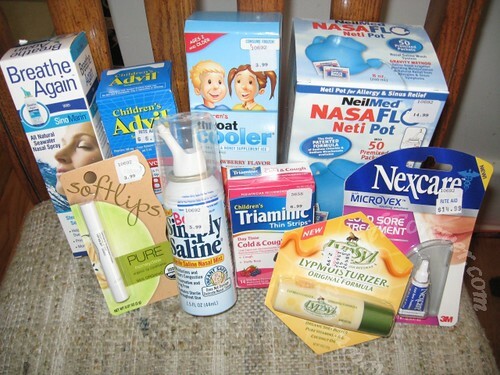 I wanted to get to Rite Aid because they had amazing deals on cold care items. There were two entire pages in thier ad of items that were free after single check rebate. I decided it was finally time to try something beside CVS and the ECBs. Below are all of the items that I purchased. The cost up front was about $43, but I should get all of that back in a single check rebate. Not too bad, especially since we are all battling things now. Something that the boys loved this weekend actually arrived at our door Thursday. 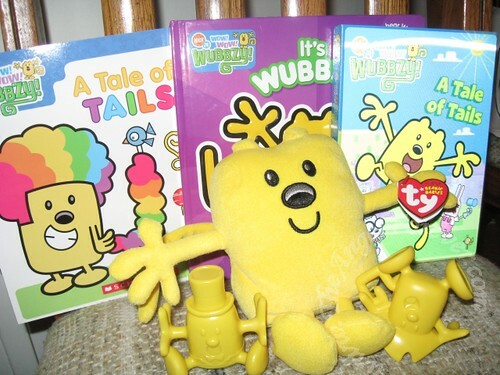 It was the Wow Wow Wubbzy giveaway package that I won from 5 Minutes for Mom. Talk about perfect timing! The boys loved watching the A Tale of Tails DVD and each claimed one of the books. Here are all of the goodies that were included. Thanks again ladies! Something pretty exciting happend to the little guy tonight, details to follow soon. Hey! Just tagged you for a “Random Meme!” Please don’t feel like you have to do it–just participate if you feel like it and have time! Cheers! Aww, poor little fella. I hope everyone is feeling better soon. Very cool timing on the prize package. I can’t wait to hear the news! When everyone is sick it’s always nice to get something in the mail. :) I agree that’s excellent timing for you guys. And wow, you did stock up. You know what I like, are those little vicks strips you put in the nightlight that feel the room with that vicks scent for which I can’t name right now for some reason. W.W. ‘s been pretty stuffed up lately too so I do know the feeling. 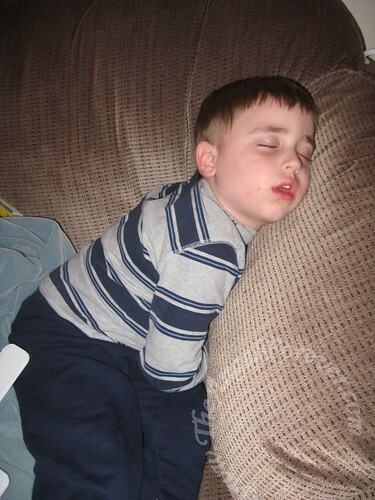 Nolan was sick this weekend- 5pm he was fast asleep and woke up at 7am NICE!